More details have emerged about Google's plan to become a wireless carrier without actually being a wireless carrier. The Wall Street Journal reports that Google's service will launch later this month but only on the Nexus 6. In other words, this Google wireless experiment is just that, an experiment. That's not bad news, per se. For starters, it's exciting that Google's apparently going to launch its new initiative to become a Mobile Virtual Network Operator (MVNO) in the coming weeks, rather than the coming months, as we though. What's more, as the Journal's sources report, Google's weaving together service from T-Mobile, Sprint, and available wifi networks sounds pretty cool. It's not that cool if you have any phone except a Nexus 6. 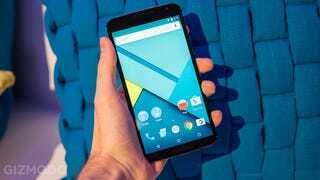 (Even a Nexus 5 isn't supposed to work with the new service.) But it's a cool idea!